Trentham Brass Band had a fabulous evening on Saturday 21st April, when they took part in the City of Stoke on Trent Male Voice Choirs’ concert – ‘The Last All Clear’. 30 players entertained a packed house at Longton Central Hall with music from 100 years ago, including ‘Tiger Rag’ and Holst’s ‘Mars – The Bringer of War’. There was lots of flag waving and community singing of the old war songs. 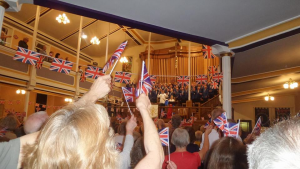 Jane Johnson , soprano singer, wowed the crowds with ‘Rule Britannia’ and the Whitchurch WW1 re-enactment society were performing throughout the whole concert.